We just returned from a week long cruise on Royal Caribbean’s Allure of the Seas. We had a terrific time and I have a lot of great foodie tales to share with you in future blogs, but first I have to tell you about their new soda package. On Royal Caribbean Cruise Line (RCCL) they offer drink ‘packages’. Think of these as a way to pay in advance for your beverages. There is an all inclusive package that includes wine, beer, sodas and limited types of mixed drinks and there is a basic soda package. We also purchase the unlimited soda package as it’s easier and cheaper than paying for each soda we consume. For $39.99 per person we were given a drink mug and a sticker on our room key that would allow us unlimited soda’s at meals and at any bar location. You can either present the mug or, if you don’t feel like carrying it, you can just show your room key with the sticker to receive your soft drink of choice. 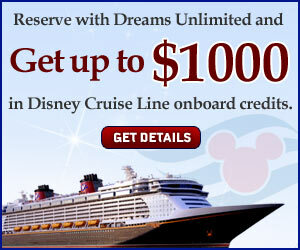 We are big fans of this program and get it every time we take a RCCL cruise. However, this time there was an unexpected twist. The Allure of the Seas has added FreeStyle Coca Cola machines to the soda package!!!! 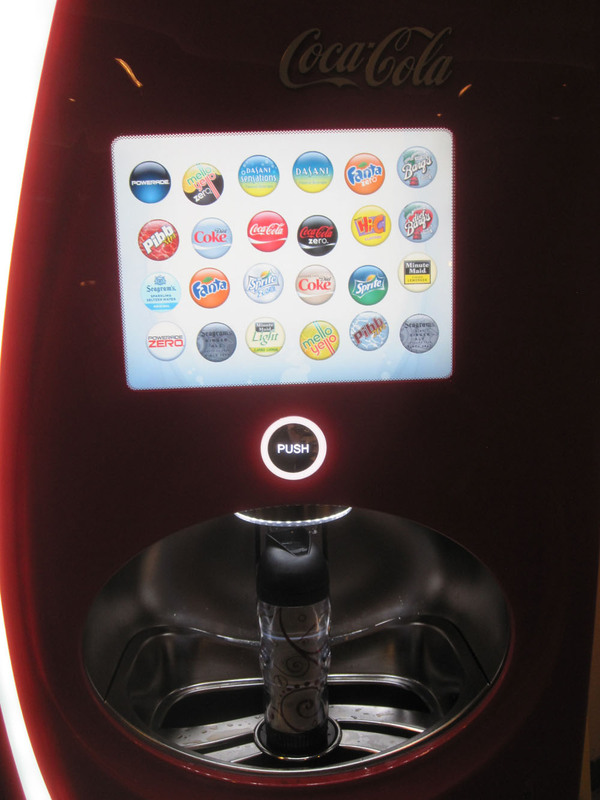 Located in three separate locations, all you had to do was bring your prepaid soda mug to one of these machines and it would dispense any flavor combination of any Coca Cola product you desired. This is definitely how they dispense soda in Heaven!! 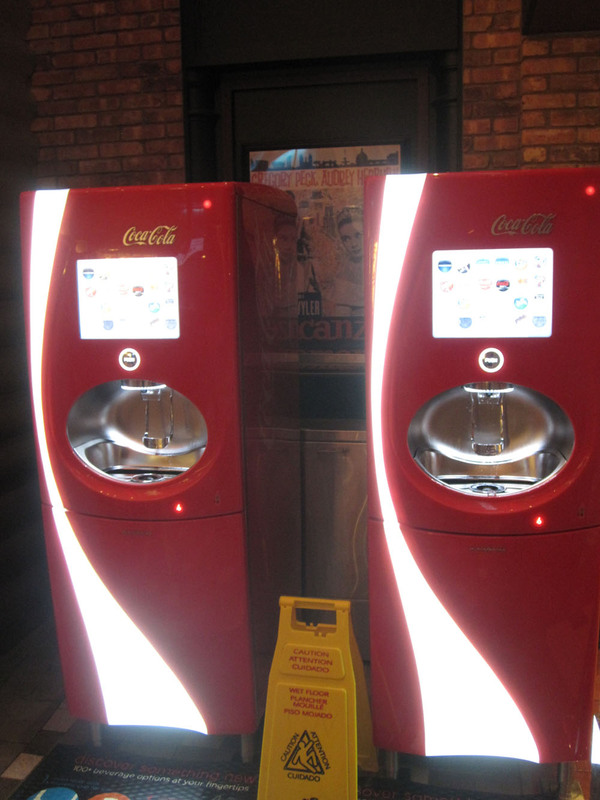 The machine boasts over 100 different choices of Coca Cola products with all of the ‘base’ options offered such as Coke, Diet Coke, Coke Zero, Caffeine Free Diet Coke, Sprite, Diet Sprite, Seagram’s Products, Barqs Root Beer, HiC, Powerade, Fantam, Dr. Pepper and much more. Now where it gets interesting is you can add a multitude of flavors to each choice. The options for the Caffeine Free Diet Coke alone were cherry, vanilla, raspberry, lime, lemonm cherry-vanilla and orange. I’m sure these might change based on the machine you get but as you can see it’s a pretty impressive selection. My drink of choice…Raspberry Caffeine Free Diet Coke!!! Something that really impressed us, and caused much conversation, was how they managed to control who used these machines and when. It turns out each refillable mug that was purchased had an RFID chip in it that the machine could read. When the mug was inserted into the dispensing area of the machine we would see a message on the machine that told when the mug could be used until. If you tried to use anything other than a refillable mug you received a message that no mug was found and you should try again and/or go buy one. We also noticed that there was a built in wait time in between having a specific mug filled. 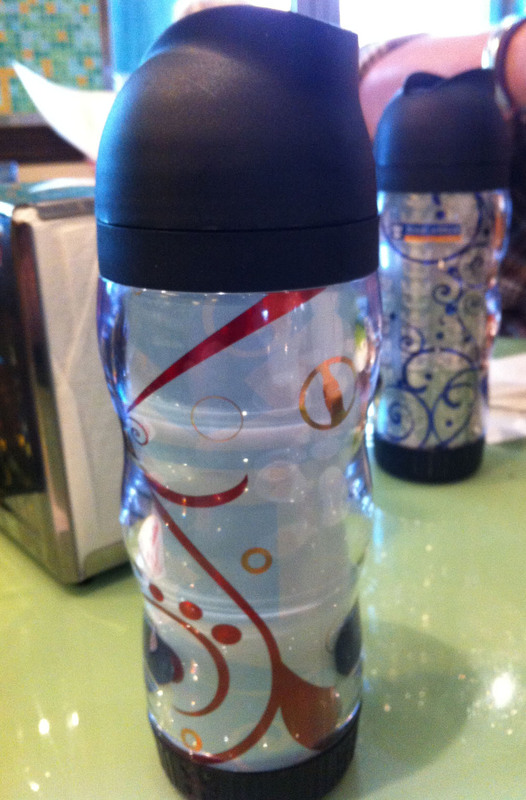 This was to prevent you from filling your mug and pouring the contents into another glass and then getting more. Needless to say we used these machines multiple times during our vacation and loved having them. We actually felt sad leaving the ship on the last day due in large part to missing the FreeStyle Machines we have come to rely on. We were sad that our sodas would come with no special flavors and after only a few short hours I was already missing my Raspberry Caffeine Free Diet Coke. The next day after our cruise we went to the movies and what do we see on the menu? They are offering Freestyle Coke Products!! We couldn’t get our own, but still it was an incredible find for our favorite cinema. The day after that we stopped at a Wendy’s drive through and they were offering Freestyle Coke Products. It was as if while we were on the ship a culture shift had occurred and Coca Cola Freestyle Machines were being introduced all over our small town….and I couldn’t be happier!!! 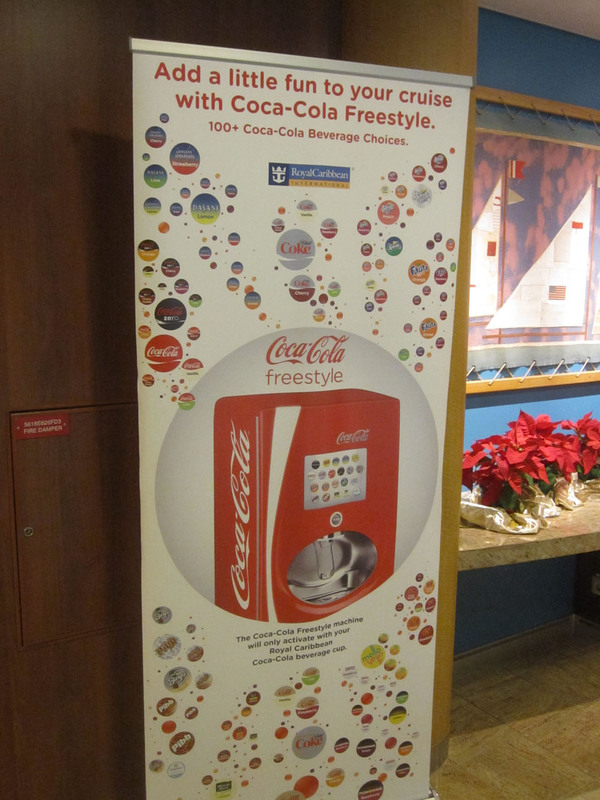 For some really great information on the Coca Cola Freestyle machine go here http://www.coca-colafreestyle.com/. It includes an interactive page that allows you ‘play’ with the machine. There is also an app you can download that will help you find machines near you. This entry was posted in Foodie Travels, Royal Caribbean Cruise Line and tagged Allure of the Seas, Barqs Root Beer, Caffeine Free Diet Coke, Coca Cola, Coca Cola Freestyle, Coke, Coke Zero, Diet Coke, Diet Sprite, Dr. Pepper, Fantam, HiC, Powerade, Raspberry Caffeine Free Diet Coke, RCCL, RCCL Allure of the Seas, RCCL Soda Package, Royal Caribbean Cruise Line, Seagrams Products, Soda Package, Sprite by John Magi. Bookmark the permalink. Not sure if you have this chain by you, but Moe’s Southwestern Grill has these soda machines, too. I’m not a big soda person (much prefer seltzer) but I have tried a few of the flavors, and I really enjoy the different lemonades. I am seeing these machines around some of the fast food places here in Central PA. I know of a Burger King and a Wendy’s that has them. They certainly are entertaining and you could spend hours thinking of combinations of flavors of sodas.